This episode of the podcast has been surprisingly fun to put together. There’s nothing like a lot of time and distance to make mistakes seem kind of funny. It makes me genuinely happy to think of saving you from some of the mistakes I’ve made. So many of them have simple fixes, or can be avoided through awareness. 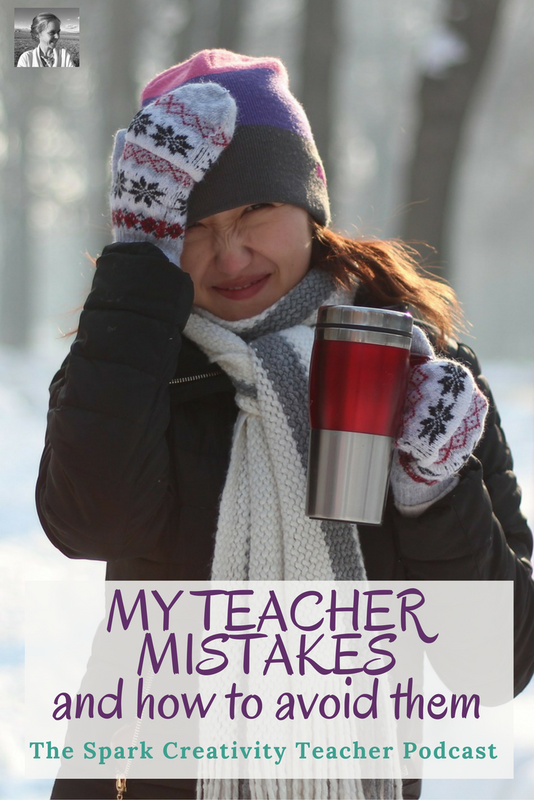 I hope by listening to this episode (or reading this blog post) you’ll save yourself from many of the difficult or awkward situations I’ve been in in my teaching career. You can listen here (or on iTunes) or read the post below instead! Let's start with some of the specific, easily fixable mistakes. You may have heard me talk before about the disastrous mistakes I made on my first ever first day of school. It was my one and only day of lecturing - what a disaster! I realized right away that the first day should reflect the type of teacher you are; there is no need to lecture if you plan to teach through creative activities and projects. 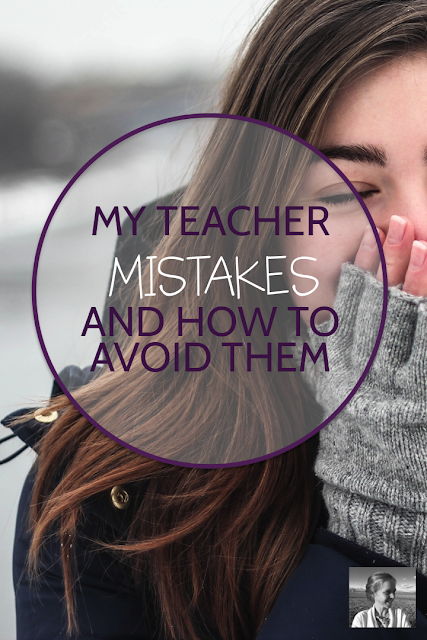 I wrote a full post with the solution to this mistake that practically caused me to leave teaching, and you can find it right here. #2 Same Class, Different Day! As a new teacher, there is SO MUCH to keep track of. Between managing the attendance and grading for every section, juggling the reading, planning the lessons, attending all the meetings, showing up for every tutoring session and athletic practice, and making a good impression on parents who think you are a student, there is rarely time to dust yourself off and look at the big picture. When I started teaching I had never heard of a teacher planner. Now they are everywhere you look. In my first year I was making my own weekly schedule each week on a piece of white paper, then typing up a daily schedule every night that took me through the day minute by minute. But even with this time-consuming effort, I still managed to mix up my sections one week and teach the same class for a second time. That's why I say, find an incredible teacher planner you love and let it be your best friend. Don't monkey around with notes on your phone, notes on your hand, notes on your iPad, and post-its all over your desk. Just cleave to the planner. At the end of my first term teaching, a few things happened. I collected four sections worth of massive creative projects. I realized that it was going to take me about fifteen hours to write the comments I was required to complete for each student with the grade reports. And my computer crashed. Whee! After days of staying up until midnight to complete everything, I finally finished my grading and comments at three in the morning the day they were due. Never again! If you schedule major papers and projects to be due a week or two before the end of term, you'll be able to spread out your grading and your final grade report processing. Students will appreciate it too, as many teacher stack assessments into the final week of term and it is overwhelming for everyone. It wasn't until my third or fourth year that I discovered just how much time, commenting, and arguing a really well-designed rubric can save you. Putting in the effort to design some you really like for creative projects, major papers, presentations, and performances will save you dozens of hours later on. On a similar note, be sure your rubric is general enough to cover all the iterations of your projects. I used to create seven or eight separate rubrics when I gave creative projects with many different options. So unnecessary. In my second job I taught mainly students who spoke English as their second language, which spurred me to start an independent reading program to help them fall in love with reading in English, thus hopefully improving their vocabularies and writing skills. It was wonderful, and it made me realize I should have gotten started with a classroom library much sooner. These days I consider myself a Public Relations Agent for books, and I love touting the wonders of my favorites to students. If I could go back in time, I definitely would have started this program on day one of my teaching career. I began teaching with the expectation that whenever a student wrote words on a paper, I should read those words. And comment on them. And give a grade to them. NOOOOOO! After six or so months of drowning in piles of papers, I realized the wonders of the check, check minus, and check plus. Then I discovered how much older kids like stickers. And stamps. I still have my Bulgarian "DOBRE" ("good") stamp that I special ordered while I lived in Sofia. There is no need to grade every tiny thing. There is not even a need to grade every major thing. You can have students choose their favorite work for you to grade, or do several rounds of peer feedback and self assessment before you take over. Now, moving into the big picture mistakes. The first advice (and most frequent) that I received as I began my career was that it was OK to say no. OK not to advise every club, OK not to let the robotics team meet in my room during lunch, OK not to help create costumes for the school play, etc. And I thought I was doing pretty well with this one, until I took a step back and realized that although I had said "no" two or three times to requests from students, I was still working sixteen hour days routinely. That was when I realized I was never saying no to my inner super teacher. The one who thought sacrificing all my sleep for student engagement was a totally perfect trade. The one who felt I should watch fifty slam poetry video clips to be sure I had picked the best three for class. The one who was willing to make cookies at eleven o'clock at night for our Transcendental Illuminations party the next day. While I love my inner super teacher, I eventually learned I would have to shut her up sometimes if I wanted to stay in the profession. By the end of my first year I was in tatters, crying on my steps one evening as I tried to decide whether to quit teaching. In the end, I decided to stay put, but I made myself a full page list of rules and boundaries that were going to keep me going. Though I can't remember any of them now, they represented a change in mindset. Engaging and empowering students is as important to me as ever, but now I know that won't be able to do that if I can't continue in the job! I'm sure you've spotted that this one is pretty much another way of putting the first mistake. But it's a big of a twist. My mom has been quoting me the words of one of her first mentors for many years. They were working in a pastoral care program in Seattle together, and my mom rather memorably brought one of the homeless women she was trying to help home to her new husband, suggesting that she might need to live with them for a while. "Care," her mentor said, "so you can continue to care." He was a minister, and together with his wife, he adopted eighteen children over many years. So he knew a thing or two about caring. As teachers, if we don't care for ourselves, there will be nothing left for us to give our students. Personally, I need to work out almost every day with good music or a good podcast in my ears. I need to eat food that I like. I need to see the people I care about for a while. It's not so much to ask! Think about what needs you have that you must honor. Then honor them. It's that simple. I'm not a big fan of confrontation. When my husband has an issue with someone at work, he will seek them out and talk about it. By the end of the day, he's generally to be found smiling as he relates the way they worked it out. When I have a problem with someone at work, I try to pretend it isn't happening. For some reason, this coping strategy hasn't paid off. Somewhere in the middle of my career, during a stint with a fairly dysfunctional faculty, I realized that the drama going on around me was all but ruining my job. I'm getting better, little by little, at having the conversations I need to have. At defending my choice reading program against people who think YA is a waste of time. At explaining that I didn't know about a certain directive that was never explained to me and that's why I didn't complete it. At asking for a few minutes to talk to a colleague who I feel has judged me unfairly. It's not easy for me. Really not easy. But to ignore these issues is to ruin some of the joy that I find in teaching. Because I need to have good working relationships with my colleagues to be happy in my job. And chances are, you do too. So convincing yourself to be honest and direct, even vulnerable when necessary, just might be worth it. Ready to take your teaching to the next level? Hop into my Facebook group, Creative High School English, and share your questions and best practices with more than a thousand other creative English teachers around the world!